Today I would love you to talk in your update post about how many books you check out when you go to the library. What do you do if a book is due, you can’t renew it, and haven’t read it? Interesting timing because I just came back from dropping off books at the library. My new reads aren’t in yet. Generally, I check out 6 or 7 books, a mixture of genres, lighter and heavier reads. Usually though I have 1 or 2 still at home so on average I have about 8 books out at any one time. My library is awesome technology wise. I generally order books all from home and then just go in and pick them up. Days that I have time, I do like to peruse the shelves and see if anything just catches my eye. If a book is due and there is a waiting list (like Under the Dome), can’t renew it and haven’t read it, I usually return it and put it back on hold, that is if I haven’t started it at all. If I still have a day, I push through it and finish it so I can return it. I’ve been known to set my alarm clock extra early, so I could finish a book. This is usually not an issue for me unless I am struggling with a book (see Under the Dome), because generally I am a fast reader, my kids are pretty much grown – a senior and a college sophomore, and I don’t have a significant other so my time is my own – except for that pesky job I have to go to:). I loved this book. The mystery kept me turning the pages. The setting was almost a character in its own right. The descriptions were so well wrought that I could easily picture the action in my head. There were really clever episodes of misdirection that were intriguing and kept me guessing. Really masterfully written and very suspenseful. One of the biggest strengths of this book is the characters. All of the significant characters are multi-dimensional and not through an overabundance of words. Peter Mays made every word count. I love that style of writing, especially in a thriller or mystery when the setting is so stark and isolated that it very fitting to the mood of the book. The characters all seemed like real people and even when I couldn’t understand how they could behave in such a way, they still seemed realistic. A great example of this is when Fin Macleod goes to visit a paraplegic weaver in the village, he learns of an entirely different side to the victim. I won’t say anything more but I felt that was an example of excellent character development. 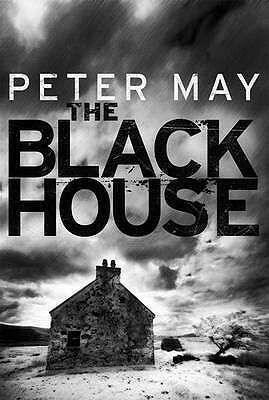 So, having said that, I returned The Blackhouse to the library and put books 2 & 3 on hold. This entry was posted in Book Reviews and tagged book, library, read-a-thon, review. Yay for another book finished. You are like me in the fact that you put all your books on hold. This week I picked up two hold books from the library and I picked two books off the shelves, but I feel pretty good with the amount of books I have right now.